This post originally appeared in The Spirit newspaper and online – The Politics is Hyperlocal will be a regular column in both publications. Congratulations, Riverwards, you’re where the action is. The housing market in Fishtown is booming and the blush of renewal is coloring even some of the darkest corners of Kensington. There is opportunity for a sustained renaissance. There’s loads of money to be made, and everyone wants in on it. You lucky Philadelphians on The Spirit’s beat are in the core of vibrant new life. You’ve been reading the election coverage here, a partnership with the news website I run with my co-editor Dustin Slaughter, Phillydeclaration.org. The Spirit and the Declaration are terribly keen on the partnership, so we’re testing an expansion of it. I’ll be writing regularly in web posts and print articles as The Spirit’s Associate Editor for Metro/Politics. You’ll see more feature coverage from the Declaration in print Wednesdays in the Riverwards, and as we gauge the temperature, we’ll explore a deeper collaboration. You’ve heard, I’m sure, the adage that “all politics is local,” often credited to former Democratic House Speaker Tip O’Neill, but in fact coined by the Associated Press’s Washington bureau chief Byron Price some 50 years before O’Neill had the chance. Price, who was also director of the US Office of Censorship during the Second World War, wrote in 1932 in his column “Politics at Random”, “all politics is local in the last analysis.” This political column will be hyperlocal, like The Spirit. This and another couple of truisms, about real estate—location, location, location and “they aren’t making any more of it”—make useful guideposts for the political coverage you can expect here. “Councilmanic prerogative” is a sacred cow of Philly governance that gives District Councilmembers nearly total control over land development in their districts. The power is not one written into law, but an archaic customary practice exercised without exception in Philly’s chambers, each Councilmember deferring to the other regarding land inside the others’ administrative jurisdictions. Either the SugarHouse Casino or The Piazza could have been halted on the drafting table at the whim of Councilman Squilla, had he been in office for their constructions. The Riverwards are rapidly gentrifying, which means that among other things the value of the land Mark Squilla (District 1), Maria Quiñones-Sanchez (District 7), Bobby Henon (District 6), and Darrell Clarke (District 5) have under their respective power will be more valuable every year. Developers will want to be friends with these four and many will be willing to attach benefits for the arrangement. 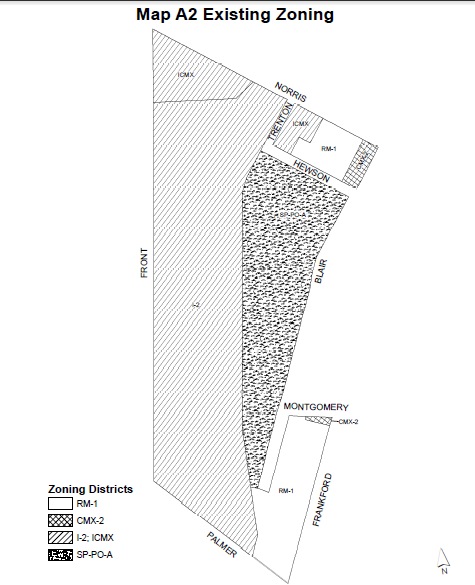 Squilla and Quiñones-Sanchez have both passed companion bills rezoning large swaths of the Riverwards through the Committee on Rules, much of it frontage on Frankford Avenue or Front Street. 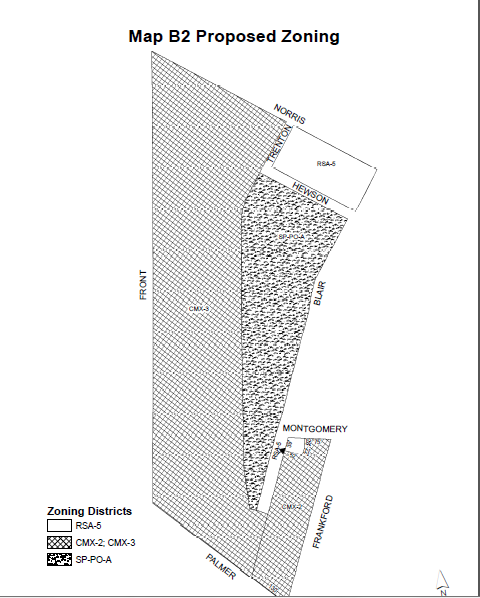 The rezoning would make various changes, but most of the new construction designations would change I-2/ICMX –zoned areas (medium industrial or industrial mixed-use) to CMX-2 zones (small scale neighborhood commercial and residential mixed use). The bills have not yet been scheduled for a reading on the Council floor, but anyone getting off at the Berks stop on the Market-Frankford Line can see that one tract in the proposed bill is already undergoing some remodeling. Government has a proper role in being stewards of development and while the District Councilmembers may be perfectly capable of sussing out what projects do or do not benefit their constituencies, the opportunity for speculation, influence and destructive gentrification is white-hot in our own back and front yards. There are around a dozen wards and about one hundred divisions within them making up the political geography of the Riverwards. There are over 100,000 residences, an expanding tax base and a vital cultural heritage which can be enriched by involvement from new settlers. Newcomers and long-time denizens alike have contributed to making this the most rapidly changing and dynamic quarter of the city, and this column is here to keep track of all that.